The experienced team at Webster Dental Care is proud to offer Crowns in One Visit to patients in St. Louis. Crowns in One Visit use the CEREC sculpting technology to create a ceramic crown that perfectly fits your tooth within a single appointment. This cutting-edge technology provides not only an affordable treatment option, but also a higher-quality crown than traditional crowns that are sculpted in remote labs. Crowns in One Visit are currently available for single, posterior crowns, which are the most commonly required crowns for local dental patients. Dr. Thakker, one of our talented dentists, specializes in Cerec Technology and is a Cerec Doctors Mentor. Unlike traditional crowns, Crowns in One Visit do not require multiple appointments set weeks apart, so patients do not have to deal with the frustration of impressions and temporary dental crowns. Your visit with Dr. Krobath or Dr. Thakker will include the modeling, sculpting and bonding of the replacement tooth, and once the new crown has set, you are on your way - Patients who receive Crowns in One Visit can leave Webster Dental Care with their new crown in less than two hours! How are Crowns in One Visit Different from Traditional Crowns? One of the most uncomfortable steps of getting a traditional crown is the impression process. In order to ensure the crown matches the appearance of the natural tooth, the dentist must make a mold using impression material that solidifies in the mouth, which can be an uncomfortable and stressful experience for patients. 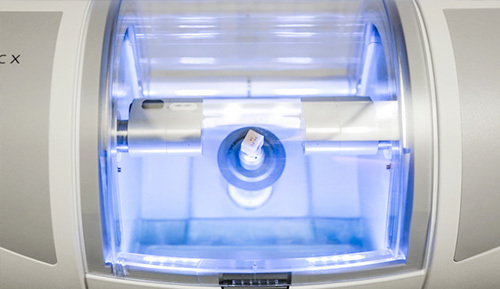 With CEREC Crowns in One Visit technology, your dentist will use a wand with an attached camera and reflected light to create a 3D image of the tooth. Then, your dentist will adjust the captured images of your natural tooth to ensure your final crown will be the most natural and comfortable fit for your mouth. This simple, non-invasive procedure is all that is required before the crown is sculpted right in our Webster office! With Crowns in One Visit, Webster Dental Care delivers the patient’s finished, permanent crown at the end of the first appointment, which eliminates the need to install a temporary crown. Temporary crowns are not perfectly sculpted to the patient’s tooth and can cause unnecessary sensitivity and pain. Because they are removed within one to two weeks, temporary crowns are bonded with a weaker cement that is much more likely to become loose and detach from the tooth. Unlike a traditional crown, patients do not need to wait weeks for their crowns to be fabricated in a dental lab during which they may not be able to continue normal eating and drinking. Using the 3D images of the tooth, the Crowns in One Visit crowns are sculpted right in our office during the appointment, so patients can watch as the CEREC machine perfectly creates their new tooth. Our patients report that Crowns in One Visit not only require less follow up but also provide a more comfortable fit than traditional crowns.